Saphir Beauté du Cuir shoe care valet cherry wood contains ..
Shoe polish boxes are ideal to store your shoe care products in. Even more practical is a stocked box with the best care products you can find. At Quality Shop you have the choice of all kinds of boxes, all striking in materials and with a quality finish. 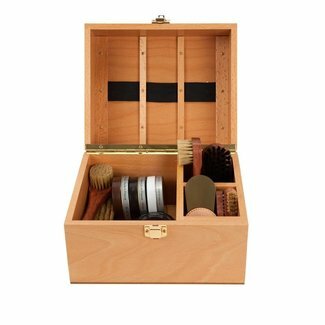 A luxurious shoe polish box is stocked with premium care products for your shoes. It is a complete set to bring your shoes in the optimal state once more. Once finished, store everything in the luxurious box and close the cover. The box is a real eye-catcher to be proud of. Have a look at the collection of the French La Cordennerie Anglaise. 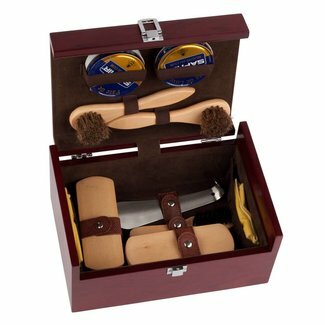 The stocked box is made of rosewood with leather grip and chrome details and is truly a joy to behold! Make life easier with a stocked shoe polish box. In stocked boxes too, we have a wide selection. Ranging from a box stocked with basic care products to a luxurious box with an extensive selection of products. The benefit to a stocked box is you have all the basic needs at hand. 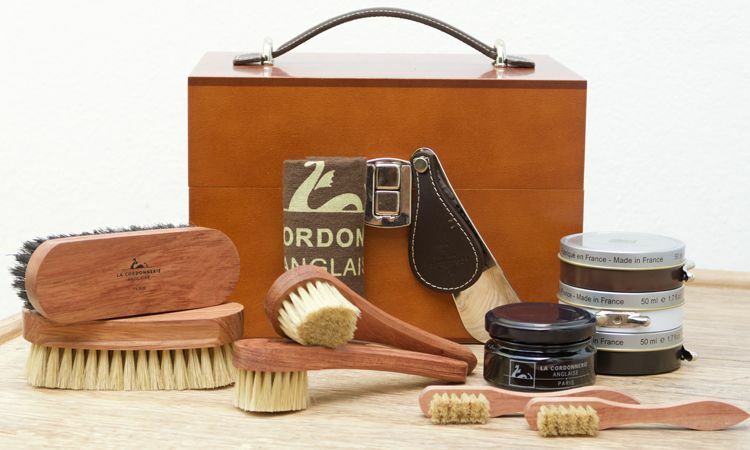 The wooden shoe polish box could be filled with a shoehorn, polishing cloth, shoe wax and various brushes. 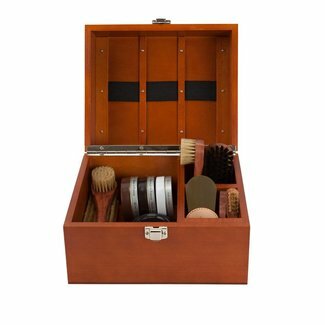 Take a look at the Saphir Beauté du Cuir shoe care box. To your desire, you can add additional care products that are suitable for your shoes. A wooden shoe polish box is not only practical but also pleasures the eye. All boxes in our collection are made of wood. You have the choice of different shapes and colours. The wooden Famaco polish box is provided with a cover and drawers. 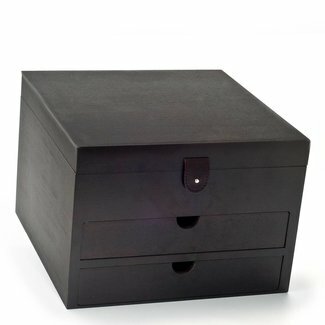 Also nifty is the Firenze box with a pedestal: a convenient aid to place your shoe on. Looking for an original gift for him? Is he a shoe lover that has everything but a good shoe polish box? Then you are at the right address at Quality Shop. We have various models, stocked or empty, you will impress him with.